Debbie Lamey-MacDonald "Working From Life. In Present Time." New Blog/ Special Commission Revealed! New Blog: Please note that all current Blog posts are now being published on my new Blog "Creative Rituals". You can join me on my new blog here! I have come to a new location to paint. It is so peaceful; that time seems endless. The evening light is captivating as it illuminates tree tops, creating halos of brightly colored greens. It boldly fills spaces not blocked by greenery and foliage. The land is transformed by nature’s spotlight. This moment will not last long, as the sun dips lower in the sky. Paint and brush work rhythmically with nature’s easy pace. The marsh awakens as winter grasses are interspersed with bright greens and new blooms. Skylight strokes open pockets of water, leading one along a lighted pathway. Winged friends rejoice in new beginnings. They sing of warmer days and a leisurely pace, only nature can provide. It is these moments that make time stand still. A sense of solitude takes hold where one merges with nature. All cares gently fall away; only the present matters. It is where pure joy is experienced. The journey for this piece began this past April when I was approached to paint a commissioned piece for an upcoming retirement. The painting was to be of an area very special to the retiree, which was in Malagash, Nova Scotia. Since I don't paint from photographs, special arrangements needed to be arranged. In my working method, I use a study completed on location, color notes and also digital images which are more for drawing purposes. The wonderful thing about this commission, is that I had free creative choice to paint what I deemed would depict this beautiful area in its glory. Soooo the adventure began! My husband and I visited the area one Sunday afternoon. (It is about one hour and fifteen minutes from our home.) When we arrived I thought I was in heaven! It was so beautiful and peaceful. I scouted around taking in the views and getting a feel for the area. 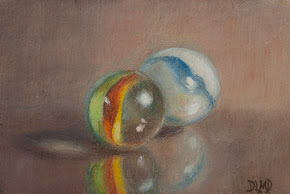 After our Sunday visit, I returned two more times and painted a study both days. It was on my final day there that I decided the above scene would be the one worthy of becoming a larger work. 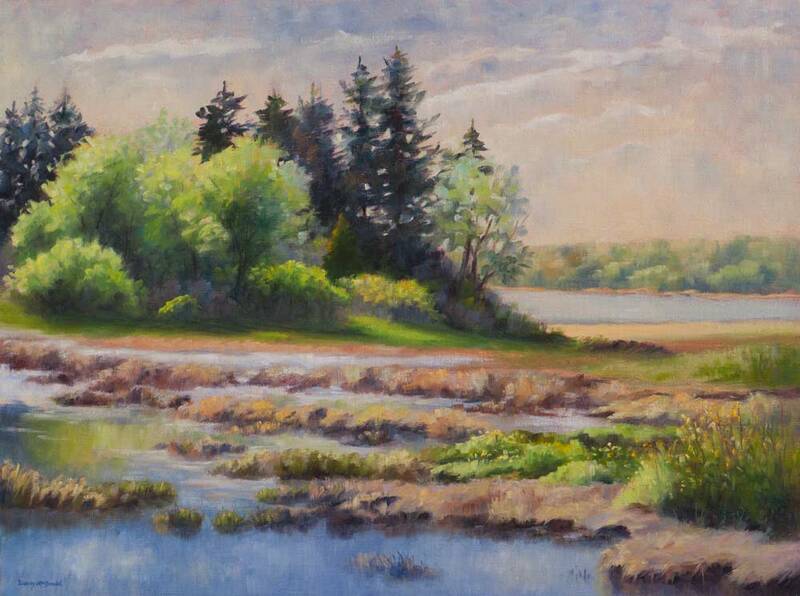 It was so beautiful the evening I painted the study for "Awakenings in the Marsh". Finally, Spring had arrived with its lime greens and new foliage. The light was breathtaking and was changing fast. I began my study at about 4:50 p.m. and finished it about 7:15 p.m. Then I cleaned up and sat down to write my written reflection to accompany the painting. By the time I left it was about 7:50 p.m. I arrived home at about 9:15 p.m. The drive home was really beautiful and I didn't have to drive very long in the dark. I was happy--I knew this study was going to assist me in designing a larger work of this gorgeous area. My subject in Malagash, Nova Scotia. The marsh area in the painting took some designing in order to make it pleasingly to the eye. Several sessions and hours later, my painting finally came to life. It was fun keeping it a surprise, even though the recipient knew it was happening. New beginnings in my studio! My palette with some grays mixed on the right hand side. 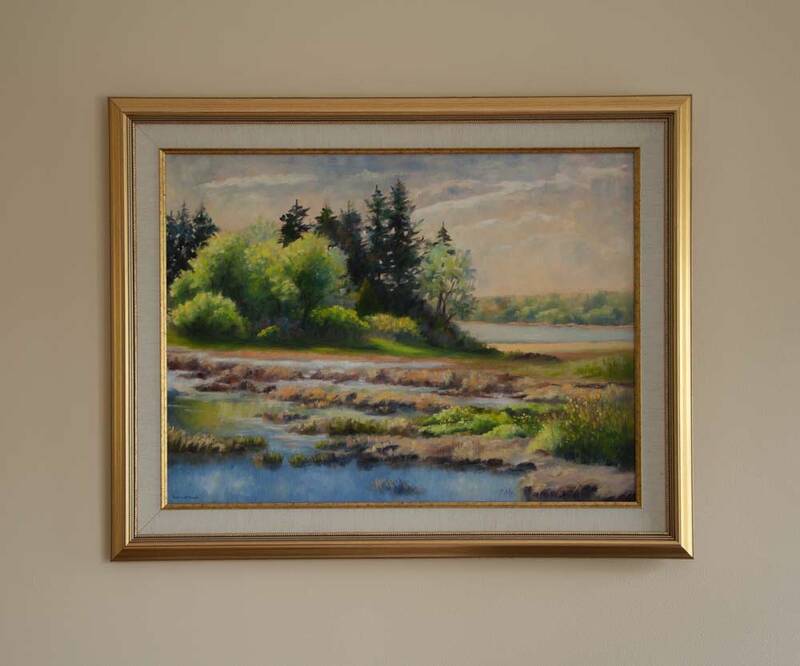 Painting this piece was extra special for me as it was for my former Superintendent of Chignecto-Central Regional School Board. Gary Clarke is both a wonderful person and a very dedicated educator. He retired with 36 dedicated years of service. As Trudy Thompson, Chair of CCRSB stated, “His dedication, commitment and passion for education has made him a truly exceptional leader for our system. He will be greatly missed.” You can read a tribute and write up about him here. I loved working with both Gary and his Assistant Jo-Anne Jarvis-Jordan on this project. Not the best pic, but framed and ready for packaging. I really enjoyed delivering Gary's painting to him. It was such an honor and pleasure to participate in this very special gift giving project! Knowing that "Awakenings in the Marsh" has really resonated with Gary and his family brings me so much joy! An emotional attachment is what we hope will be accomplished with any commission. It was fun creating this artful experience for all involved! 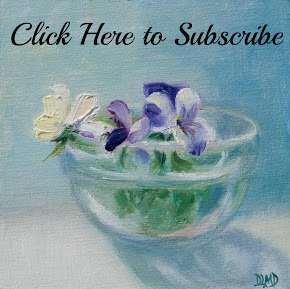 Newsletter/Blog Posts sign up--Love to have you join me on my artistic journey! New! I am now on Instagram! I would love to connect with you there as well. Thanks! After a harsh winter, mother nature is finally coming to life. Oh how I have missed the sounds of nature and fresh greens. New leaves rustle gently in the warm breeze, while birds sing their songs of praise. An elegant birch has weathered winter's woes. It stretches its branches beyond its core. Happily, it sways in the airy space, as it births new foliage. There is an easy flow in the park. One that slows down man-made time and envelops the viewers spirit. Nothing else matters---only a present moment. Mind chatter fades into the distance. Powell's Pt. Park, Nova Scotia. 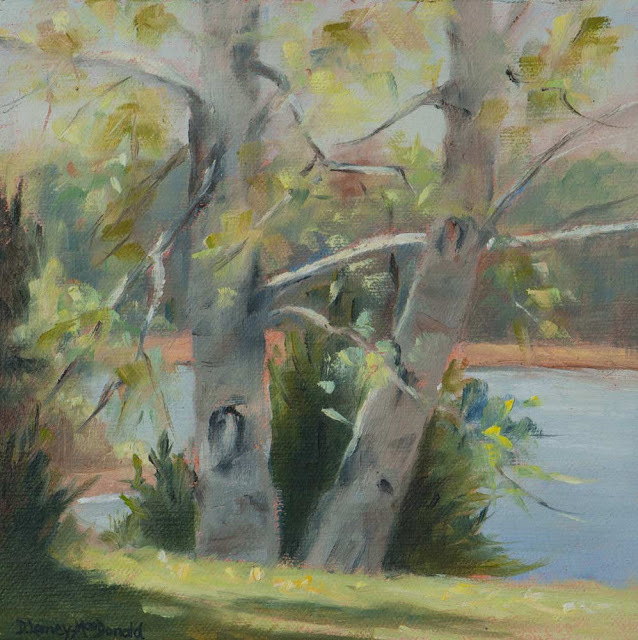 This was the first plein air painting of the season I did when Spring arrived. It was so thrilling to finally have fine weather and be back out on location. I love being alone in the park. I can feel every sinew of my body relax. I noticed I was slower painting during this session, as I warmed up to painting on location again. Painting outdoors has a rhythm of its own. In some ways its like a moving target. lol The light changes, movement occurs and decisions must be made in a timely manner. However, I love the feeling of having all my senses engaged. It is a bit like a dance--joyful and with spontaneity. This was my first Spring to be working at my art full time since I retired last year. It is thrilling to be able to observe and enjoy nature on a daily basis! If you are interested, here is a link to my newest post on my blog Creative Rituals. Thanks! 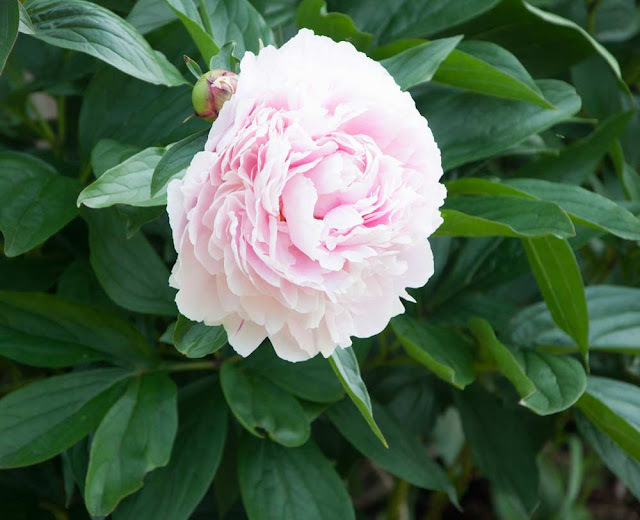 Summer Has Arrived & Timed Blooms! Summer Has Arrived, 24x12in. Oil on linen/panel. Powell's Point Park, Nova Scotia. Summer has arrived in full force with temperatures that make one slow down. Temperatures that delineate hast and dictate a languorous pace. The air is still this morning making my set up easier and adds to a prevailing calm. I have come to one of my favorite spots in the park where wild roses and foliage play peek-a-boo with the ocean beyond. The charm of wild roses in full bloom captivates onlookers, adding a regal presence to the surrounding area. 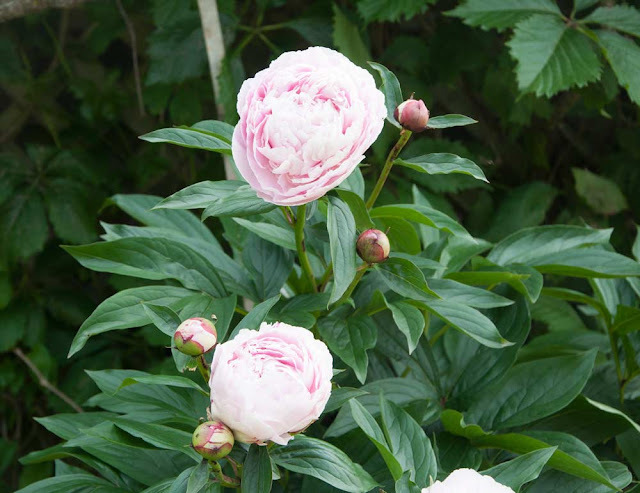 Their bubblegum pink, cheerfully scatter amongst the foliage. Throwing all cares away they bring one into a present moment, retaliating from life and its many demands. They caress the soul and nurture a place within. Nature once again delivers a gentle therapy where one’s spirit becomes renewed. This is a favorite spot I love to paint every year in Powell's Point Park. There is an abundance of wild rose bushes that bloom profusely every year. I am in love with roses and especially wild ones! 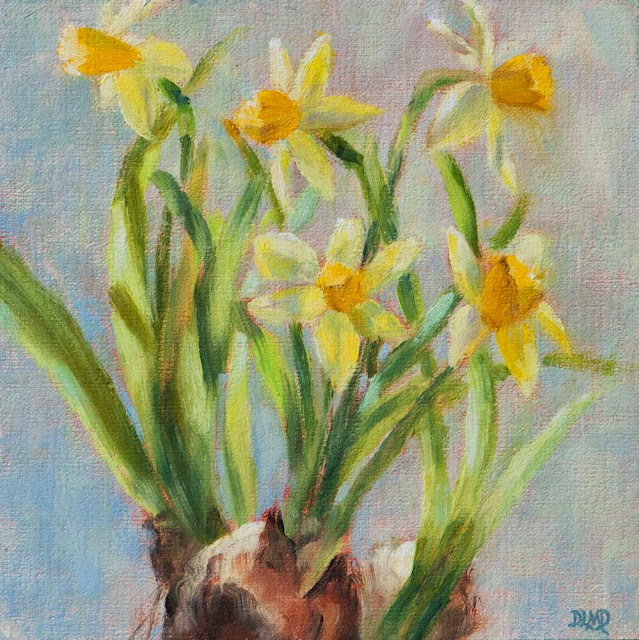 They just exude joy and symbolize that wonderful relaxed feeling of warm summer days. I completed the study a couple of years ago on a warm summer morning. 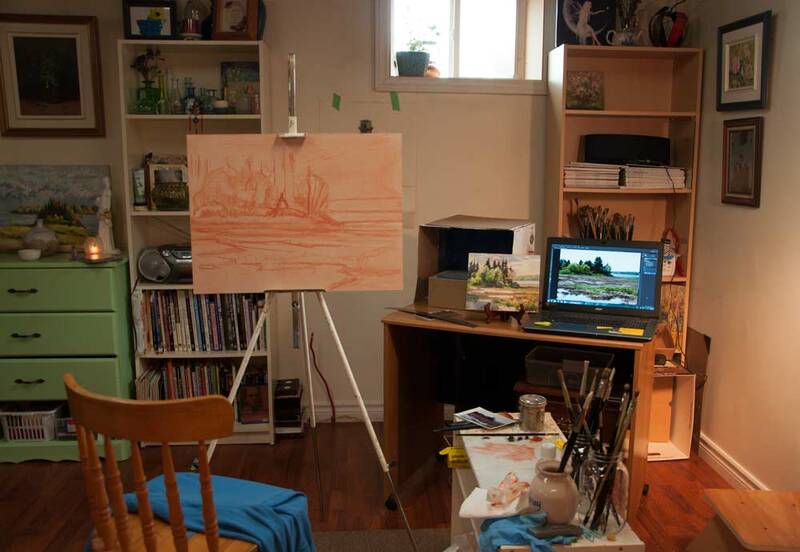 This past winter I completed a larger studio painting using my study, notes and digital images as references. I recently visited this spot again this year! The rose bushes are just beginning to bud. I can't wait for them to burst into bloom. If you are patient, nature can be so rewarding and giving. Peonies in my gardens. This one is huge! Surprise Bloom, 3x3in. Oil on linen/board. Painted from life in my studio. "After many months of greenery, a miniature orchid brings delight with one surprise bloom!" This is a miniature orchid that was given to me by one of my students, when I retired last year. 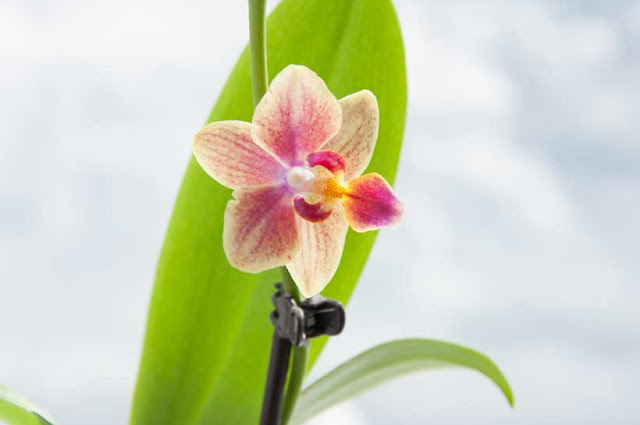 I had been admiring these little orchids for quite some time, so it was really nice to receive one as a gift. In the beginning it had a couple of blooms that lasted for awhile. Then all went green! I really wasn't sure if it was ever going to bloom again. At Christmas time I placed it in our bathroom and voila after a few weeks a tiny bud arrived. I guess it liked the humidity in that room! The bloom arrived in the midst of winter, so it was even more delightful to witness. Finally, I acted quickly and decided to paint it this time before all went green again. lol I'm going to keep it around to see if I might have another surprise bloom in the future. P.S. If you would like to read my earlier entry on my Creative Rituals Blog you can do so here. T.C. Explores! 4x4in. Oil on linen/board. 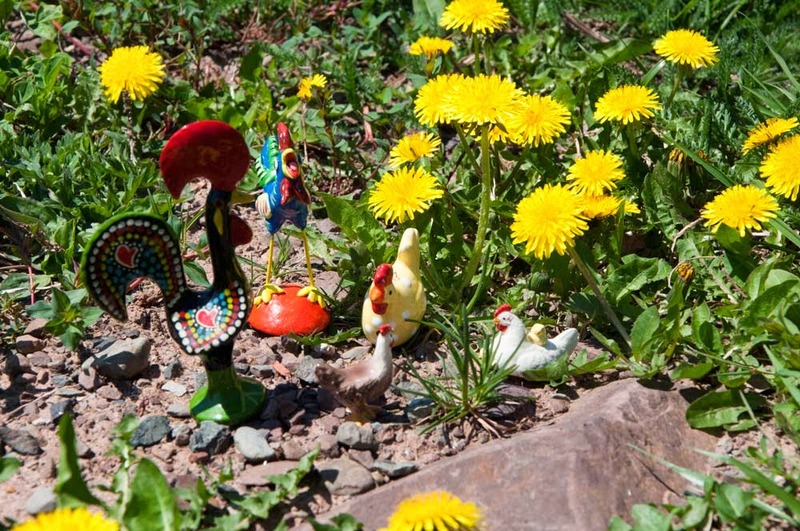 "The Travelling Chicken stops to frolic in the pansies on her visit to Nova Scotia. " As mentioned in my previous blog post I signed up for the "Travelling Chicken Project" about two years ago. The project features a ceramic chicken and her friends who visit artists all over the world. Once T.C. and her entourage arrive, you have approximately four days to paint her and/or any of the other characters. Since I paint from life, I had to get started on my painting as soon as they arrived! The artists are making the project more interesting and fun by adding stories about the characters' visits. I really enjoyed painting T.C. 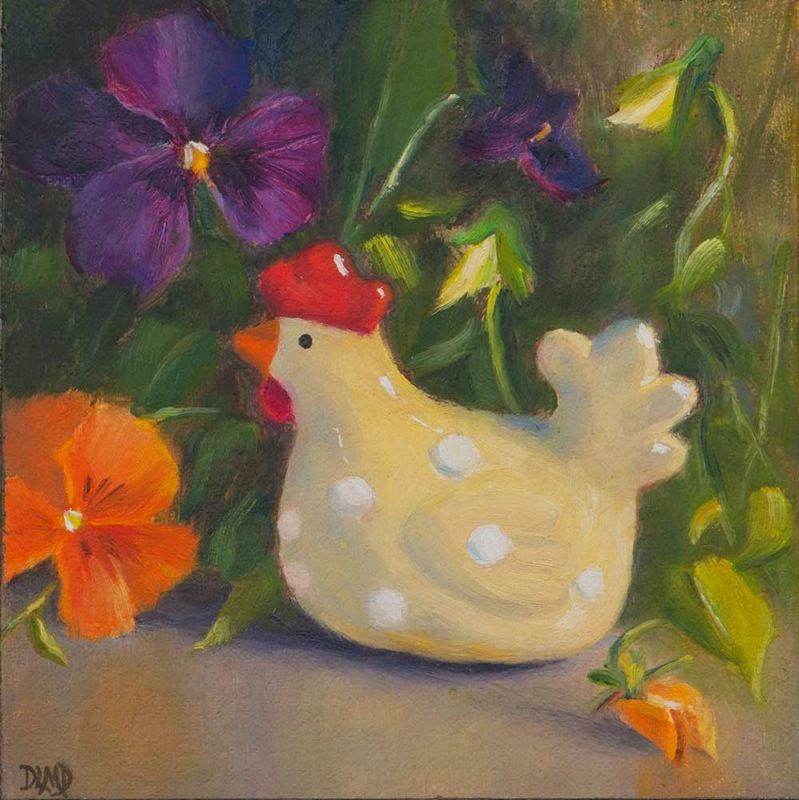 and thought it would be fun to keep the idea of painting little ceramic animals with flowers in mind for future subject matter. My still life set up of T.C. The pansies weren't as cooperative as T.C. as they liked to shift their positions! T.C. was a very patient model. A view of my subject and painting. You can read my story about T.C. 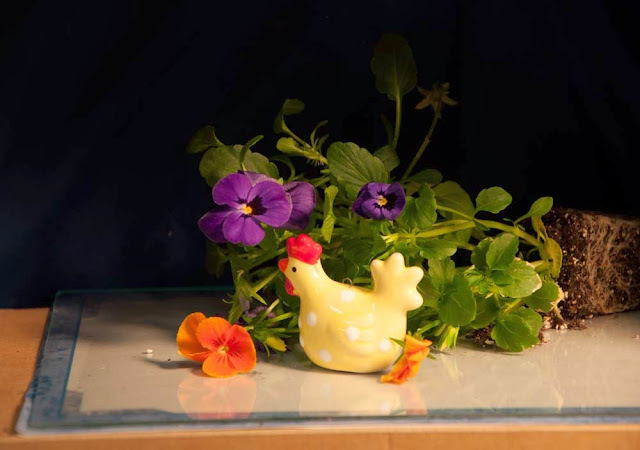 's visit on the Travelling Chicken blog. If you are interested you can also sign up to participate in the project. There continues to be a long waiting list of interested artists. 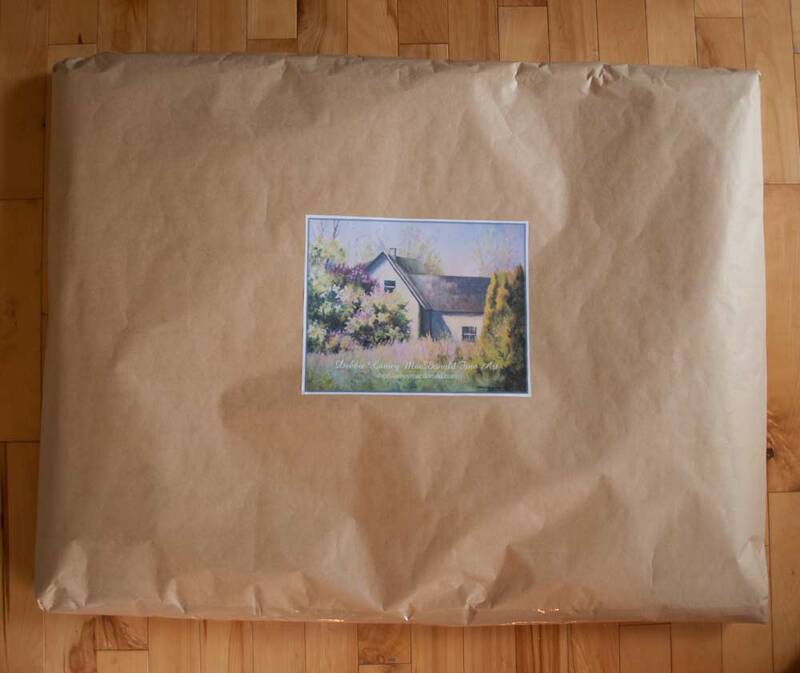 The receiving artist is responsible for shipping to the next artist on the list. The package is somewhat large as the ceramic animals are wrapped and encased in a Styrofoam box and then placed inside a cardboard box. I shipped T.C. and the gang to Delaware, U.S.
Hope you enjoy reading and viewing my story on the Travelling Chicken Blog. If you are an artist, feel free to participate in T.C. 's adventures! Bursts of Sunshine! 5x5in. Oil on linen/board. 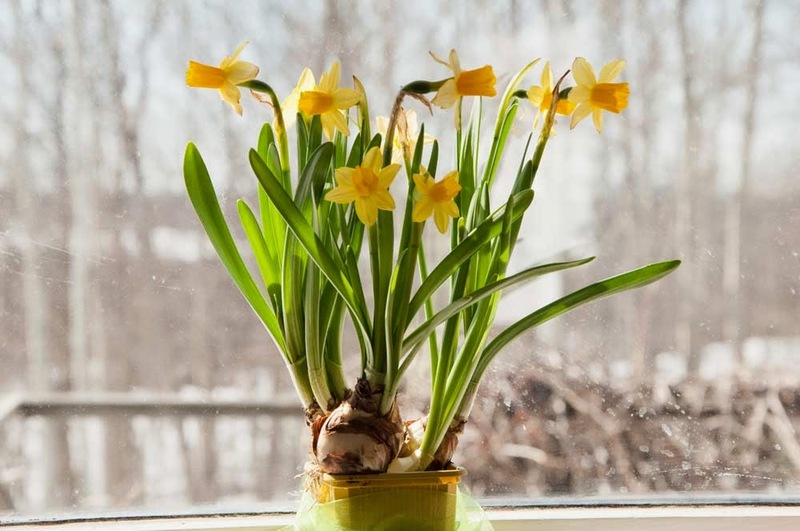 "Like bursts of sunshine, daffodils announce the arrival of new beginnings. " A few weeks ago when I was yearning to see fresh blooms and greenery, I spotted these miniature daffodils in the grocery store. I loved how their bulbs were visible and their happy faces made me smile! I knew from the moment I saw them, they just had to be painted. I placed them on my window ledge and painted them from life in my kitchen. I really loved how the back lighting created a dappled and translucent affect on their blooms and leaves. 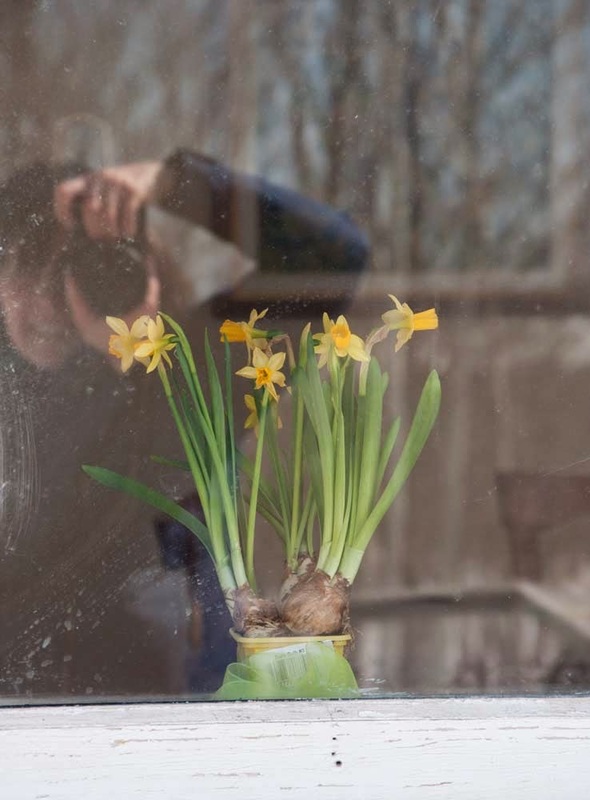 I also took this photo of the daffodils from outside--thought it was neat to look at them from the outside in! 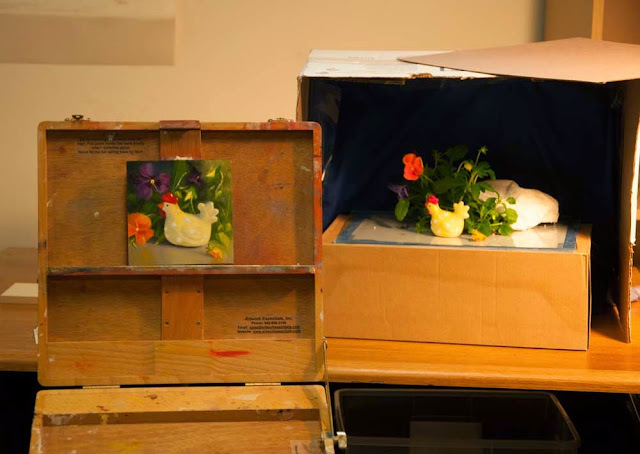 A couple of years ago I signed up for a project online where a little ceramic chicken and her entourage were travelling to artists all over the world to paint. Well the Travelling Chicken and her gang finally arrived on my doorstep last Wednesday. They have been enjoying Nova Scotia and I worked for a couple of days completing a miniature painting of T.C. 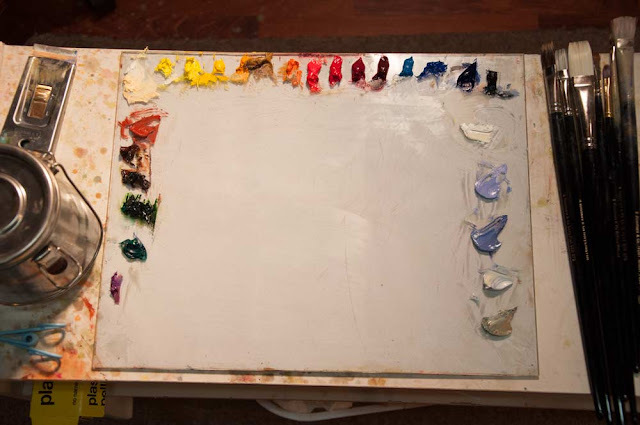 I will be posting my painting soon--stay tuned! 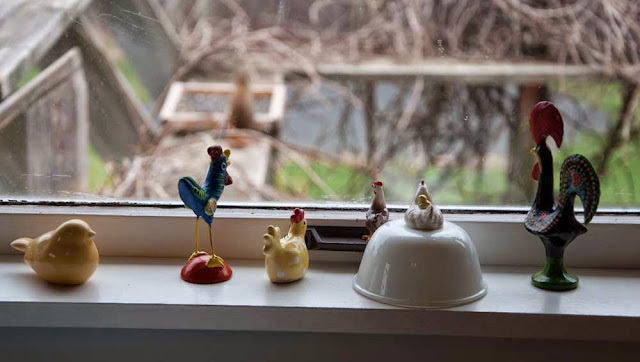 In the meantime you can read my announcement that they arrived on the Travelling Chicken Blog. Enjoy! Here are a couple of photos of the crew! The little yellow bird lives at my house--the other characters are my visitors. It is such a thrill to finally be enjoying some warmer weather! My next post will feature The Travelling Chicken. On my Easel right now. A new miniature is on my easel. I'm just putting the finishing touches on it and will be posting it soon. 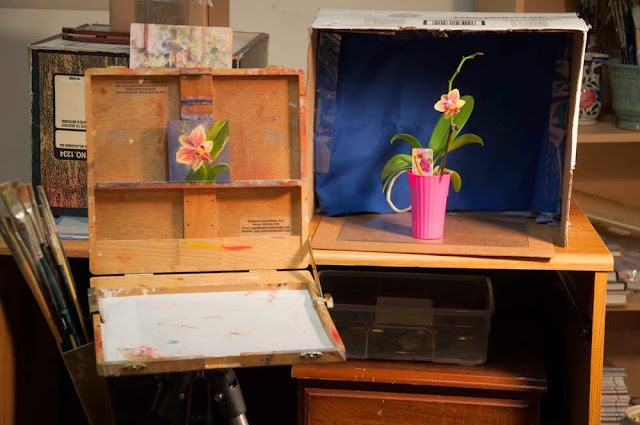 My subject was a miniature orchid I received as a retirement gift last year. I honestly didn't think it would ever bloom again! I loved capturing it in paint. In case you didn't know, I wanted to mention that I started a New Blog called "Creative Rituals". Honestly, I can't believe I started another blog, but felt it needed a separate platform. Basically, it is being used to anecdote daily or almost daily creative explorations. You can read all about my new blog on the About page. If you would like to sign up for email updates, I would love to have you subscribe here. Thanks! Wishing you a great day! I'm crossing my fingers that Spring will be here soon! So I have been a bit quiet on the internet front the last couple of weeks. I have been exploring some areas of interest; some are directly art related and others indirectly. I think it is really important and beneficial to stop and catch your breath every once in awhile. Stepping back from your regular routine and considering what is really important or what direction your intuition is pointing you in, is worth listening to. For me this happens over time where I keep getting nudges and soft whispers to listen to what my heart truly desires. The world is a noisy place; thus, we must carve out quiet personal time where we are able to listen to our intuitive thoughts. Hopefully, after we begin to listen we can adjust our path by paying attention to what we really desire. One of the areas I have been exploring is improving my drawing skills. I received a new art book which I am reading and really enjoying. I have been doing some of the exercises and feel continued practice will definitely aid in further developing my skills. 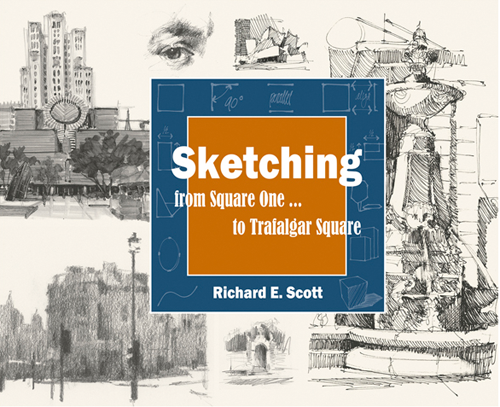 If you are an artist I would highly recommend reading this book. Another area I am enjoying learning about is a dietary one. I have always been a healthy eater, but after I retired I promised myself I would delve into this area with greater gusto. 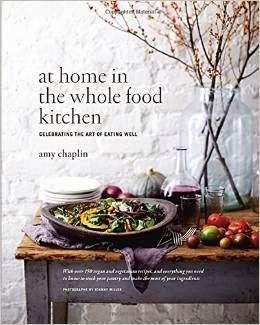 Improving your vitality through whole foods leads to a greater sense of well being which further enhances your creativity and mental abilities. It has been fun and interesting trying new recipes, watching videos and learning new information. 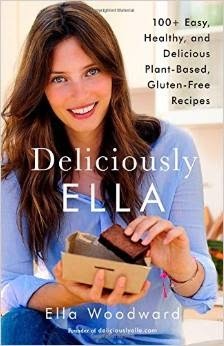 Now I am not a purist--I definitely cheat, but I must say eating fresh, wholesome foods really does make a difference in your mental functioning and vitality. Here are the two books I have been enjoying reading and experimenting with the last few weeks. You can click each image for links to amazon. So what have you've been up to? Have you been exploring any new ideas or areas of interest? P.S. I am not an affiliate for any of these books. Just thought I would share. Sign Up For My Free Email Newsletter and/or Blog Posts! 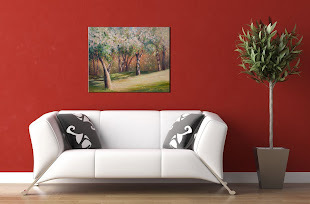 Come Visit My Fine Art Shop! 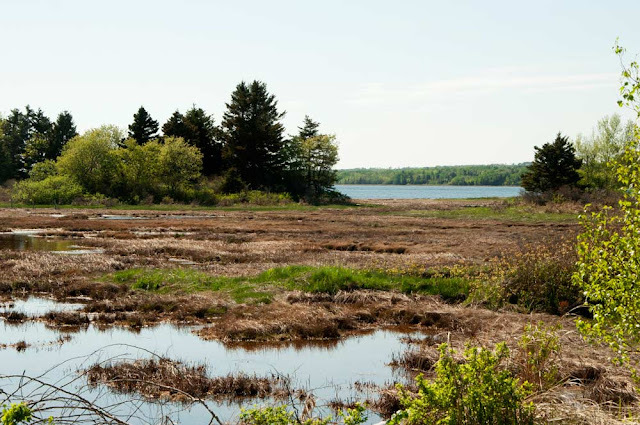 Debbie lives with her family in picturesque rural Nova Scotia, Canada. She is mostly self-taught and dedicated to working from life. Her love of nature is evident in her landscape work. 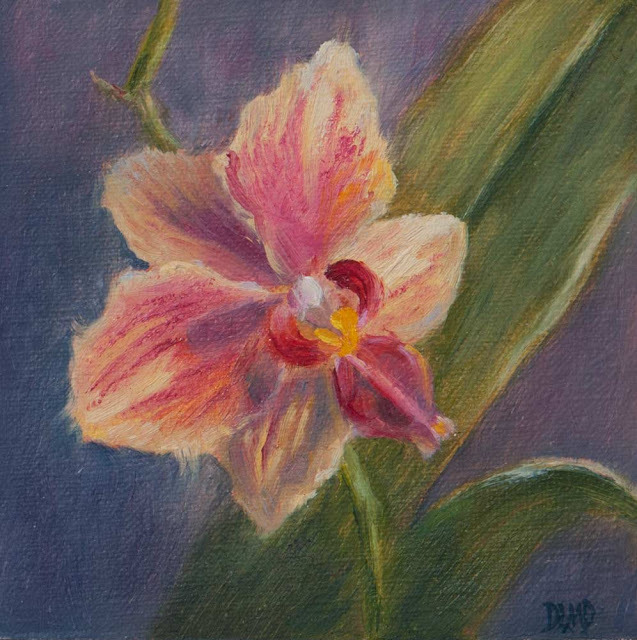 Debbie frequently works on location capturing nature's beauty in small studies and paintings. 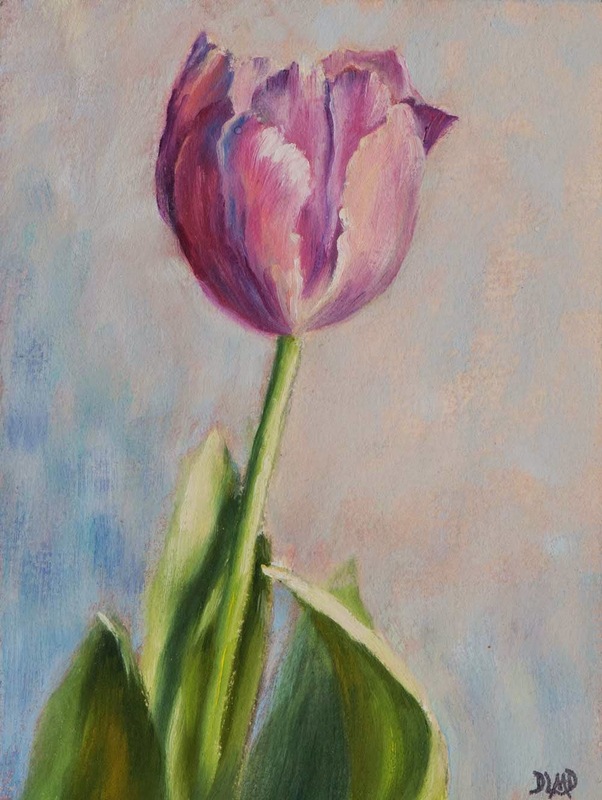 Since her early childhood years still life painting has been an intense interest. Debbie orchestrates the stage for her props in her studio and paints them from life.Debbie's love for literature and human emotion is evident in her lyrical written reflections that accompany her work. They personalize each piece of work, giving insight to a captured moment in time. Copyright © 2014 LameyDonald Fine Art. All rights reserved.. Simple theme. Powered by Blogger.